Spring is finally starting to arrive here in Korea. FINALLY! Today is one of the nicest days I've seen since I've been back in Seoul, though it's still a bit chilly by my standards. I've enjoyed my morning walking around Shinchon and I'm even contemplating waking up early tomorrow for Easter, so long as the weather stays nice. Actually, I had almost forgotten that Easter was this weekend until I was told by my co-teacher that we'd be doing an Easter art project with my kindergarteners this week. I knew keeping the kids in order was going to be a bit stressful, but I was excited to see the students having fun. I remember doing similar things as a kid and how special the holidays always felt. Although there's no concept of an Easter bunny here , I have seen people passing out or selling plain brown eggs (no dying them here) in small baskets at churches around this time of year in the past. I think most of my students understood the point of the activity as my teacher explained it to them, but I saw a few puzzled looks when she mentioned Jesus. Sorry, Buddhist students, you can put two and two together later. 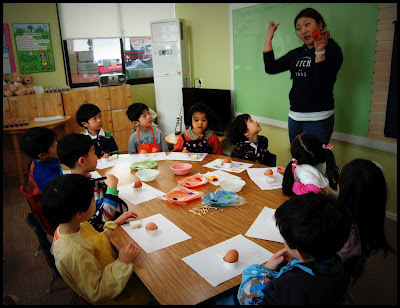 My co-teacher, Jane, explaining how to decorate the eggs. Some of my new rugrats. As egg dye is unavailable in Korea, we set up some acrylic paints, Q-tips, and small sponges and demonstrated how to paint the eggs. 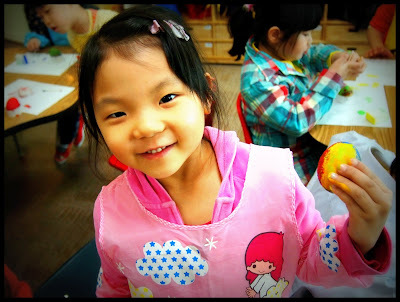 Korean kids are really funny about not wanting to get their hands "dirty." They were quite hesitant about letting the paint get on their hands, though they had no problems sticking their little fingers up their noses. With some encouragement, however, they started to get into it. A lot of the little ones I teach are extremely artistic and many of them did an amazing job with the limited materials they had to work with. Much better than I could have done. Overall, it was a fun activity for everyone and I'm quite sure they'll remember it. 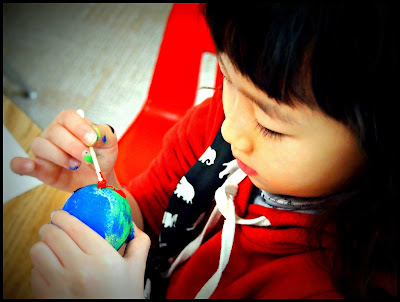 Little Daniel carefully sponge-paints his egg. Emily, proud of her creation. Speaking of eggs, I just have to mention my most recent electronics purchase. After realizing I didn't have Internet access in my new apartment, I had my recruiter purchase a KT Olleh WiBro 4G Wifi Egg for me. 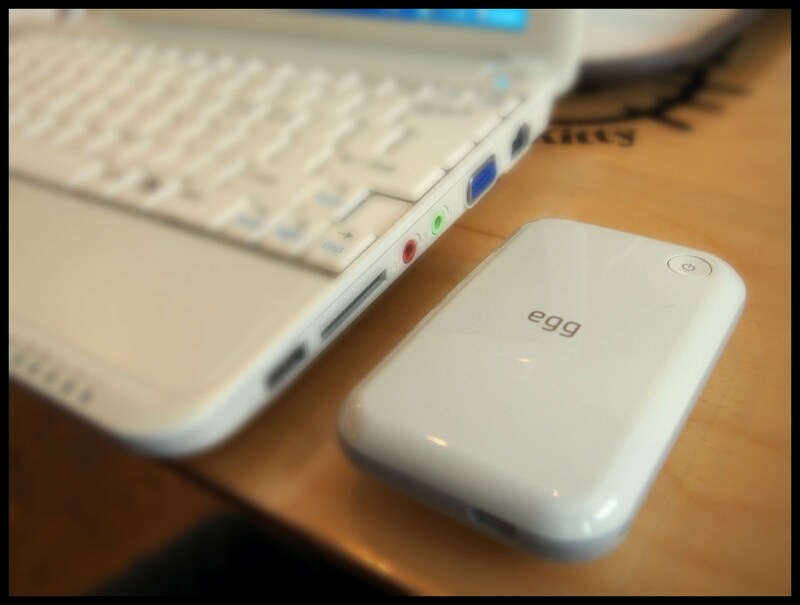 The Egg is a small, lightweight device that can easily fit into your pocket and allows you to access wireless internet from anywhere in Korea. And by anywhere, I mean you can Facebook on top of a mountain or check your email in the depths of the subway. I'm not really sure how it works, but I do know that it connects quickly, can be used with most wireless devices, and is super convenient. Korea, you just got that much cooler in my book. Plus, I only pay 11,000 won ($10) a month for 30G of internet data. Sweet deal, eh? My new toy... a different kind of egg. Until next time, I wish you and your families a very Happy Easter holiday. Or Passover to my Jewish friends out there. Or, if you don't celebrate either of those holidays, Happy Spring from Seoul!